For sale: FARRIER F9XR folding trimaran ; €89.000,- VAT paid. Main: 44 m2 High roach Elvström EPEX Vectran Technora doublesided taffeta ; two seasons lightly used. Elvström zippack Sunbrella cover at lazyjacks. Genoa: 18.6 m2 Radial Elvström EPEX Vectran Technora doublesided taffeta : three seasons lightly used. Furled on an endless furler. Elvström Sunbrella cover. Screacher: 42 m2 North 3DL ; at the end of its lifecycle. Furled on an endless furler on the bowsprit. Rig: carbon boom, carbon bowsprit, aluminium rotating mast, SS forestay, dyneema shrouds on Precourt toggles, backstays. The mast can be raised or lowered by one person. Outboard: Yamaha 9.9 high thrust four stroke; 2005; dealer maintained. Electronics: Echopilot forward looking depth sounder (very comfortable at higher speeds), Garmin main nav-system with colorplotter (touchscreen, AIS-receiver) and vhf with outside speaker, Simrad autopilot with remote control. Trilens radarreflector. Two Vetus-batteries 70Ah (2018). Mastervolt battery charger. Air-X windgenerator. LED navigation lights. Comfort: Sleeps five to six on extra thick mattresses. RadioCD-player on outside speakers, Isotherm fridge drawer underneath raised floor, three burner SMEV cooker with glass cover on double gas tanks, 12V- en 240V-sockets. Cactus dry toilet. Dimmable interior lighting partly LED. Trailer: tandem axle, low mileage, never salted, regularly maintained by dealer. Various: Cockpit tent to enlarge living. Cockpit table. Farrier mast raise system, mast supports. Anchors, ample warps and fenders. Giant sun awning from float to float, etc. Maintenance: Out of sailing season AERO rests inside on her trailer. Spring 2018 she was treated with Orange Fluo antifouling and most outside parts were painted by a professional yacht painter. The Dutch pages contain beautiful pictures. Besides this you can click in the menu on ‘Meer foto’s’. Loading the images can take a few secs. You can upsize by clicking on them. AERO is a custom built F9XR trimaran. This is the thoroughly tried and tested 31 footer design by Ian Farrier in the X-version, which is not often for sale. In this version the main hull flares out more above the waterline than the standard F9’s do. This results in a roomier and more comfortable interior and in extra width which also gives even more sailing stability. The center cockpit delivers pleasant shelter on open water and comes with a private aft cabin (e.g. for children, but actually it provides a most comfortable 2ps bed). AERO’s first owner was an experienced boat builder. He built this Farrier in 2002 / 2003 in Florida in composite: Divinycell foamcore, epoxy and biaxial glass. The beams and folding system came directly from the Corsair-factory. Other Farrier-owners are enthusiast about AERO’s extreme stiffness and the professional processing of the materials. Health problems made it impossible for the builder to enjoy his work very long after completion. The R (of race) in the typename is added by second owner Gregor Tarjan, well known yacht architect and multihullguru of USA’s east coast (see www.aeroyacht.com). AERO was his personal boat upto 2010 and he had refit her to his ideas by the Farrier-/Corsair-specialists of The Multihull Source in Wareham, Massachusetts (see www.themultihullsource.com) with (among other things) carbon parts to create an extreme light-footed, fast trimaran without compromising the high building qualities. He only did this to increase his own sailing fun. AERO has never been in races then nor now. Consequently AERO was maintained by Te Multihull Source. The large picture going with the History page in Dutch on this site shows AERO anchored in a bay nearby Tarjan’s house on Long Island. In 2010 AERO was bought by her present owners, who transported her on her trailer on a ro-ro-ship to the Netherlands. The trailer was converted to meet European requirements. The interior that had become very sober as a result of Gregor Tarjan’s demand for weight loss, got some luxury and the nav equipment was renewed. The hatch with its ‘racey’ fighter jet canopy was replaced with a more standard covered hatch and small sprayhood. The dyneema shrouds were renewed and got backstays, which made it easier to adjust leech tension and which made the Farrier mast raise system infallible. The outboard was replaced with a very reliable Yamaha 9.9 and stripped from its remote controls and tiller connection. This resulted in a major improvement of AERO’s maneuverability while motoring wich is a blessing in limited spaces, e.g. in ports and locks. The only remaining sail of the top-of-the-bill North 3DL set from 2007 is the screacher. Main and genoa are recently replaced by a not less ‘racey’ but far more durable Elvström EPEX-set. This site is mastered by Luc Pont, owner of AERO. According to his parents he could sail before he could walk. Well, maybe he just got a little late into walking. 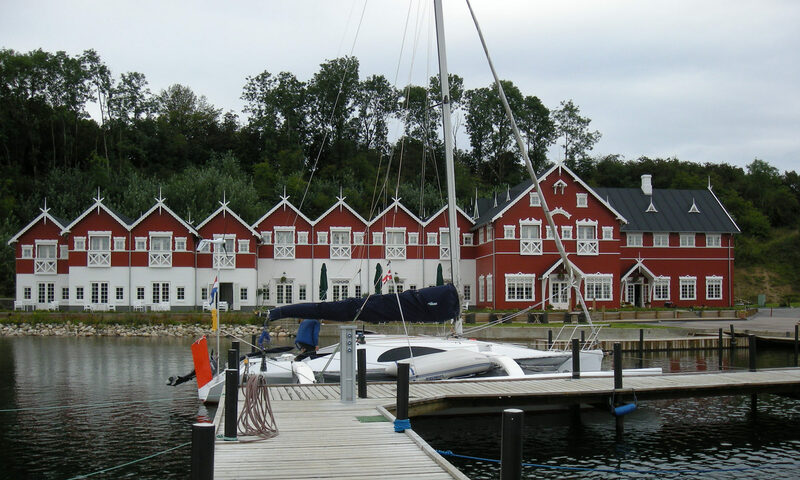 However, in the many decades since then he first sailed with them all the inland waters of the Netherlands where a sailboat can come and after that he sailed the North Sea and Scandinavian waters with his wife. Their regular sailing area is the delta of Zeeland and Zuid-Holland, inland as well as coastal. 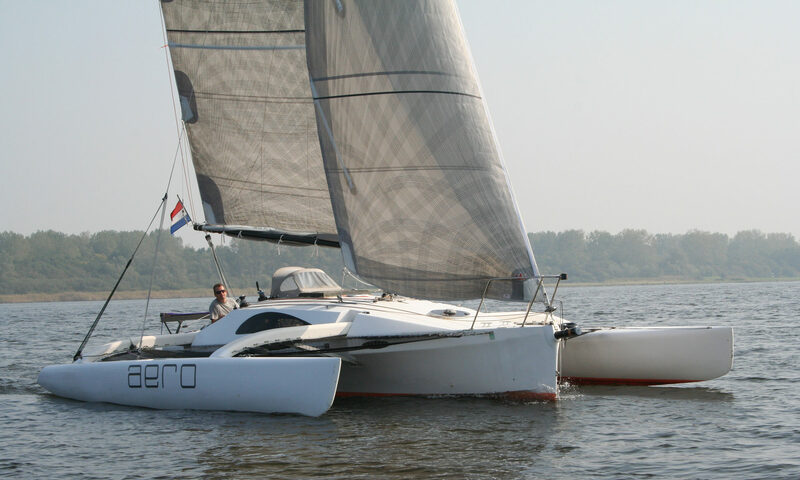 AERO is their fifth sailboat and second trimaran (the fourth was a Dragonfly 920). Stability and speed is what made them convinced multihull sailors. Another strong feature is the trailerabilty that makes it possible to sail in faraway waters without the stress of getting there or (even more important) getting back in time. Ofcourse they don’t quit sailing when AERO is sold, but getting older reveals that it is time to move to a less sporty multihull. Are you interested or do you simply want to know more about AERO, please don’t hesitate to contact me through info@pontext.nl or +31 624678678.